If you're using FullStory and HelpScout Docs, you can add FullStory to Docs to see exactly how users are interacting with your documentation. We'll walk through how to set it up and some common searches you might use within FullStory. (And if you haven't already seen it, check out our FullStory <> HelpScout integration). 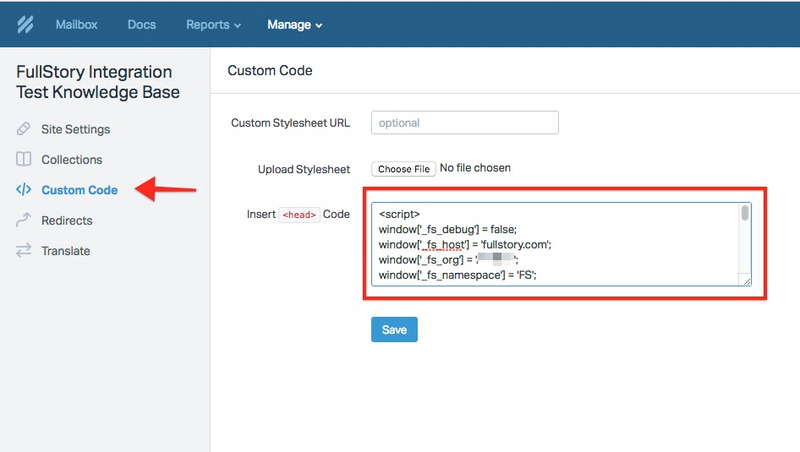 In the "Insert <head> Code" section, paste your FullStory recording snippet, like so. That's it! Once you save the configuration, FullStory will load on all new page loads, and you'll be able to see visits from users to your help site. Note: as long as your help site has the same TLD-1 domain as your main site (e.g. help.example.com and app.example.com), visits to your help site and main site will appear in the same session.